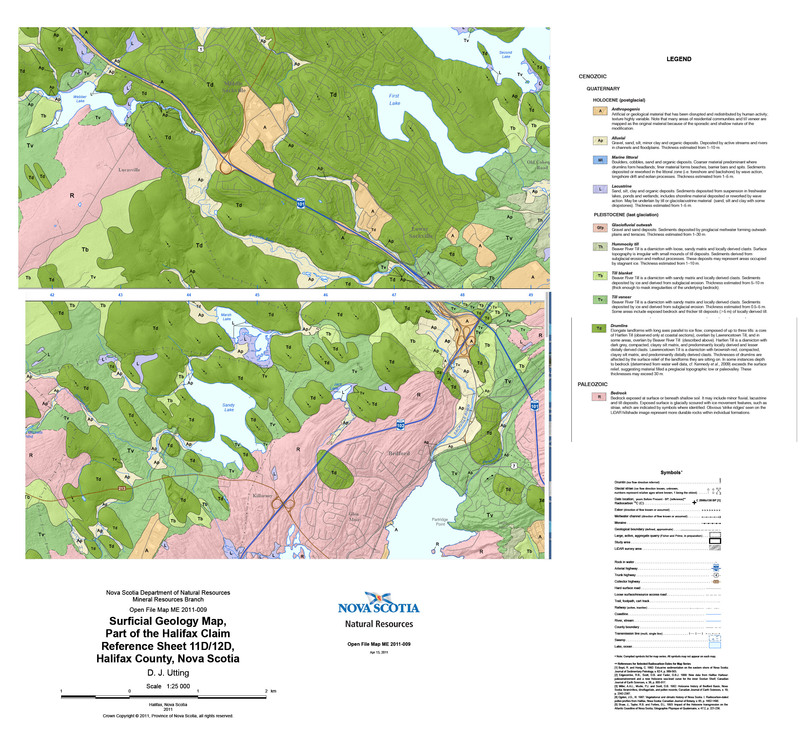 Extracted from Digital Surficial Geological Data of the Halifax Metropolitan and Surrounding Areas, NS (2011) Map Map OFM ME 2011-009. These are Lidar based maps. 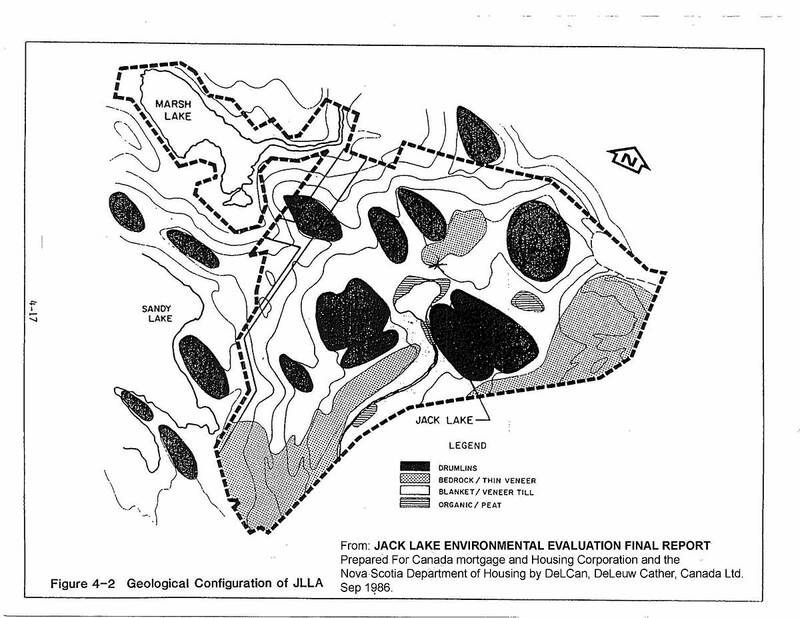 From: JACK LAKE ENVIRONMENTAL EVALUATION FINAL REPORT Prepared For Canada mortgage and Housing Corporation and the Nova Scotia Department of Housing by DeLCan, DeLeuw Cather, Canada Ltd. Sep 1986. Sourced in SRA files. Jack Lake Land Assembly is situated within the Southern Upland physiographic region, (Goidthwaite, 1929), which is the southern extension of the much larger Atlantic Uplands, an erosional plain which once extended across the Atlantic provinces (Roland, 1982). This physiographic region underlies most of Southern Nova Scotia. In the vicinity of Jack Lake, the area is characterized by a rolling topography with broad, smooth ridges and hollows generally following the northeast strike of the underlying bedrock. The substantial road cut by the Bicentennial Highway illustrates the structure of these parallel ridges. Field reconnaissance has shown that much of the southwestern portion of the land assembly is comprised of bedrock ridge outcrops with intervening boggy depressions. Rounded hills up to 30 m in height are developed on the bedrock surface on the eastern side of the site. These glacial till drumlins exhibit long axis orientation in a northwest to southeast direction, along the assumed direction of ice movement. The Bedford area of Nova Scotia is underlain by paieozoic-aged (Cambro‑Ordovician Era, 500 miilion years ago) metasediment of the Meguma Formation, which is locally comprised of graywacke and minor slate of the Goldenviiie formation. This is conformabiy overlain by slates and minor Nquartzites of the Halifax slate formation…Figure 4-2 shows the locations of bedrock, drumlins, till and organic soils. Surticial geology mapping indicates that the Jack Lake Land Assembly is covered with a thin (1-2m) veneer of loose to compact oligomictic sandy silt‐till. The sandy tills are developed over much of the resistate upland areas. 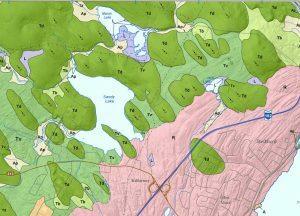 Superimposed on the basal till sheet are a number of elongated northwest oriented drumlins ranging in thickness from 3 to 46 metres.It appears that most of the lake bottom sediments on Jack Lake and Sandy Lake have been eroded from the surrounding drumlin hills.